Reno, Nevada where an acrobatic city council rolls over and plays dead for corporate greed. On Feb. 8, 1996, in a ceremony at the Library of Congress, President Clinton signed legislation revamping the telecommunications industry, saying it would "bring the future to our doorstep." [Courtesy of the New York Times e-bulletin.] EDITOR'S NOTE: Mssrs. 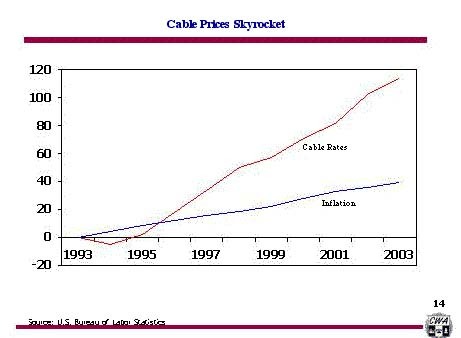 Clinton, Gore and Gingrich forgot to mention how expensive their monopolistic future would become. In summer, 2005, the Reno City Council filled one vacancy on the Citizens Cable Compliance Committee by appointing Donald J. "Joe" Dowden. Founding member Noel Thornsberry resigned effective Oct. 15, 2005, given his relocation out of state. We wish him well and applaud his three years of outstanding service. Any Reno resident wishing to serve may contact City Clerk Lynnette Jones at (775) 334-2030 for an application, or apply via the city's website. UPDATE 1-17-2006: In mid-December, the council reappointed Chuck Lanham but did not reappoint Andrew Barbano. The panel thus has two and very possibly three vacancies on a seven-member board. When it decided on December 1, 2005 (for the second time last year) not to extinguish the CCCC, the council charged the panel to review Charter's non-compliance issues and report back in January. As of this update, no meetings have been scheduled. In early 2005, the City of Reno's Boards and Commissions Review Task Force recommended that the Citizens Cable Compliance Committee be eliminated. The task force agreed with McNeely Administration staff that city employees could do the job and that the committee is unnecessary. At its meeting of 23 Feb. 2005, the Reno City Council voted down the recommendation to kill the cable panel. It is ironic that the Dec. 1 agenda also includes the council's first consideration of the committee's Oct. 7 report finding Charter in noncompliance and a discussion of the city's federal legislative priorities, which should certainly include U.S. Sen. John Ensign's bill to eliminate franchise fees, just like State Sen. Randolph Townsend's, R-Reno, move in the latter stages of the 2005 Nevada legislature. Does Charter merit deregulation by the City of Reno? Call, write, fax and/or e-mail the council and McNeely Administration with your opinion. Ignoring a $54,000 study, the city and the cable company have reverted to the status quo ante. The study and the citizens committee empaneled afterward have been ignored for more than three years. Perhaps the committee's latest research will force results, but don't bet on it. As Reno's greatest mayor Barbara Bennett said a quarter-century ago, city hall is "infested with special interests." Nothing's changed. The Citizens Cable Compliance Committee meeting of Oct. 7 was not cablecast. Download the agenda in Adobe Acrobat Reader from the city's website. At the Oct. 7 meeting, the committee regretfully accepted the resignation of founding member Noel Thornsberry effective Oct. 15, 2005. (Interested Reno residents may apply at the latter link). Mr. Thornsberry was presented with a letter of appreciation from Reno Mayor Bob Cashell for his three years of meritorious service. Reno Community Relations Director Steven Wright told the committee that the Oct. 7 meeting was "not about Charter." Well, it certainly was not about the great televised baseball game we were missing. The company promised Wright a response by Oct. 11. An update was published in the 11-27-2005 BARBWIRE in the Sunday Sparks Tribune. Stay tuned and keep your Tums dry. IMPORTANT CONSUMER NEWS: Sen. Ensign tries to accomplish nationally what Sen. Townsend failed several times to impose on Nevada. A new offensive has been launched in the war against consumers through total deregulation of all utilities. (Didn't anybody learn from Enron and Adelphia?) Sen. John Ensign, R-Nev., wants to ban all franchise fees and thus eliminate public access television, which, along with the Internet, NPR and PBS, remain the only media not in the thrall of the corporate right-wing attack machine. Watch this site for updates. Read the extensive history of the issue in Nevada immediately below. Reno City Council commits cable co-dependency: Charter must love us because they so sorely abuse us. So let's give them everything they ask for. After all, if they're corporate, they gotta be smarter than we are. Charter files for complete deregulation in Reno, Sparks, Carson, Washoe and Clark counties. Municipalities must file objections by Nov. 28, 2004. UPDATES: The City of Reno's Boards and Commissions Review Task Force recommended that the Citizens Cable Compliance Committee be eliminated. The task force agreed with McNeely Administration staff that city employees could do the job and that the committee is unnecessary. At its meeting of 23 Feb. 2005, the Reno City Council voted down the recommendation to kill the cable panel. As of the end of November, the CCCC has met three times in 2005, the most recent at 6:30 p.m. on Thursday, Oct. 7,, at the new City Hall black tower across the street from the Mapes Hotel Memorial Graveyard and Posy Patch. Meetings are usually cablecast as they happen on Sierra Nevada Community Access Television (SNCAT) Sparks-Reno-Washoe Charter Channel 13 with several reruns thereafter. Stay tuned to this website and Barbwire by Barbano in each Sunday's Sparks Tribune. Click here to read the Feb. 20, 2005, agenda. Please consider signing up for our mailing list. Stay tuned, stay in touch and tell a friend. In summer, 2005, the Reno City Council filled one vacancy on the committee by appointing Donald J. "Joe" Dowden. Founding member Noel Thornsberry resigned effective Oct. 15, 2005, given his relocation out of state. We wish him well and applaud his three years of outstanding service. Any Reno resident wishing to serve may contact City Clerk Lynnette Jones at (775) 334-2030 for an application, or apply via the city's website. DISSED AGAIN  In a portent of indignities to come, our January 2004 meeting was kicked out of the council chambers by McNeely Administration staffers who scheduled a private party's function instead. We cannot cablecast our meetings outside the council chamber. We tried to move it to the following week but could not get a quorum. City officials continue to try to marginalize the citizens committee toward cosmetic status. They underestimate the streetfighters who sit thereon. FEBRUARY 2004 MEETING  Click here to access the agenda. 10-8-2004  CCCC makes a radical & visionary recommendation to the council. READ. 10-13-2004  McNeely Administration staff makes a negative recommendation, as usual. READ MORE. Dazed and confused by Councilman Dave Aiazzi, the council takes no action. READ IT AND WEEP. 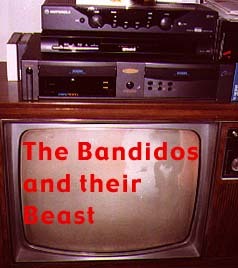 The Thursday, October 28, 2004, meeting was on, but TV was off, then the meeting was off. Click here to follow the bouncing ball. Chuck Lanham, chair; John Barber, vice-chair; Andrew Barbano, recording secretary; Floyd Dean, Barbara Stone, Noel Thornsberry. 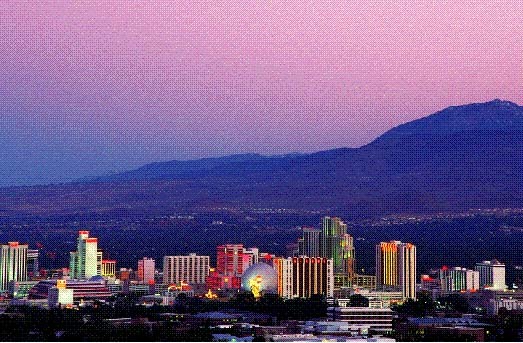 UPDATE: In summer of 2005, the Reno City Council appointed Donald J. "Joe' Dowden to fill the sole vacancy. Founding member Noel Thornsberry resigned effective Oct. 15, 2005, given his relocation out of state. We wish him well and applaud his three years of outstanding service. Any Reno resident wishing to serve may contact City Clerk Lynnette Jones at (775) 334-2030 for an application, or apply via the city's website.